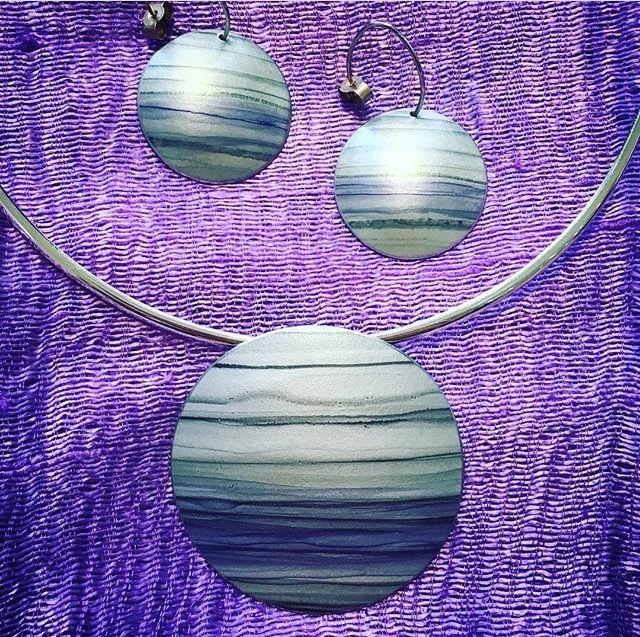 One of the benefits of using aluminium to create jewellery is that it is extremely light and easy to wear. It is also sturdy and robust and combines very well with sterling silver findings and chains or collars. The other major benefit is that the regular surface makes it wonderful to decorate in a variety of ways. It also makes the pieces affordable and unique, hand crafted pieces can be acquired for a comparatively modest price. 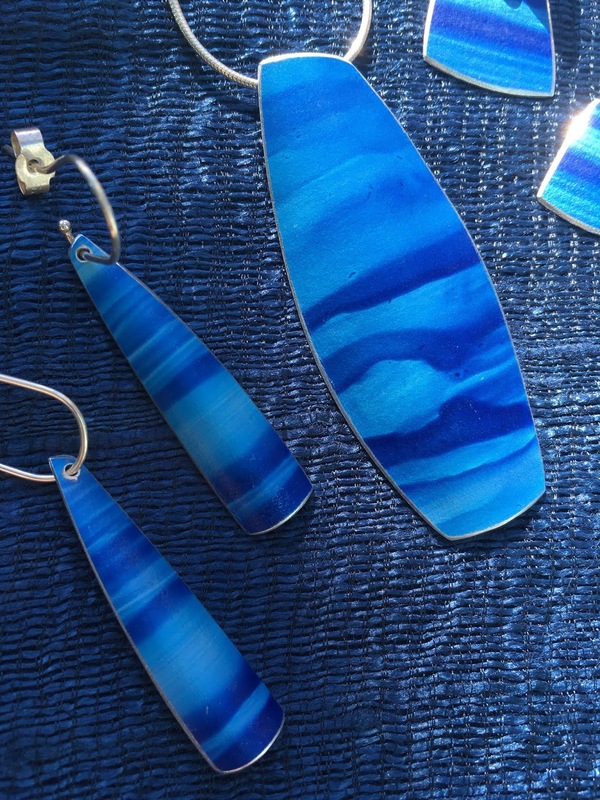 Wonderful anodised aluminium pendant and earrings by Penny Warren. These are all available from our Cowes boutique. or to order over the phone. So what is 'anodised aluminium'? A simple explanation is that aluminium, usually in sheet form, is immersed in a tank containing a solution that conducts electricity. A charge is passed through the tank and particles of material are deposited on the surface of the metal. This creates a durable, porous coating which is able to readily absorb dyes. This surface treatment also improves durability by resisting corrosion and wear. The silversmith is able to create jewellery from the sheet metal, using dyes to achieve a range of patterns and colours. Anodised aluminium and sterling silver earrings and pendant on a hallmarked sterling silver collar. These can be ordered by phone on 01983 243055, as a set or individually. Here, at The Earring Collection, we have a wonderful range of aluminium jewellery designed by Penny Warren, a Brighton based silversmith. The pieces range from striking, dynamic colour to shimmering streaks and lines, suggesting land and seascape.